Heat griddle or large nonstick skillet to about 300°F. Lightly oil or grease with shortening or cooking spray. In food processor, combine beans and banana. Cover; process 30 to 45 seconds or until smooth. Add eggs. Cover; process 20 seconds or until smooth and well blended. In medium bowl, mix bean mixture and baking mix until moistened. Spoon a scant 1/4 cup batter on griddle; spread to about 4-inch diameter. Bake until edges are set and bubbles form on top. Turn over and bake until golden brow and pancakes spring back when tapped on top. Serve with fruit and/or pancake syrup. 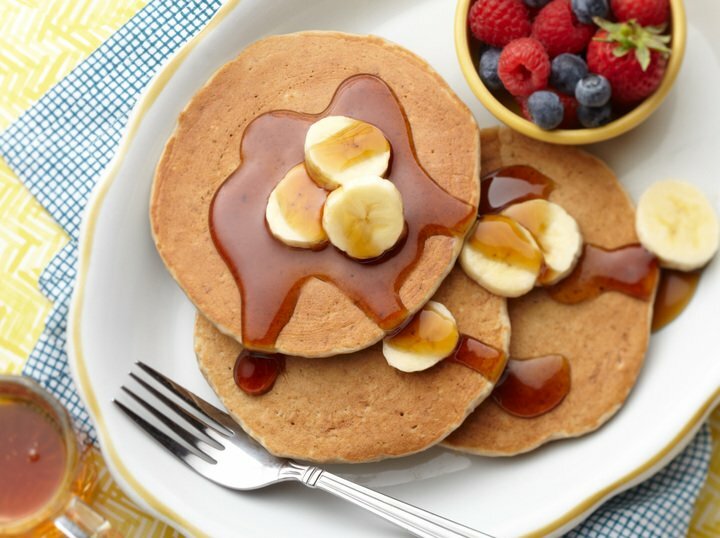 Tip: These pancakes brown quickly so we are baking them at a slightly lower temperature than usual. Adjust heat if needed.